Princesses, knights, fairies, and magic have long had a strong hold on our collective consciousness. Just look at all the popular movies and series in recent years, such as the very popular "Once Upon a Time" series, the "Shrek" movies, or "Snow White and the Huntsman". These were made either for all ages or a more adult audience. Consider the very mature-theme musical by Sondheim, "Into the Woods" which confirms that fairytales and princesses really aren't just for little kids. So it seems perfectly appropriate to plan a Fairytale Theme Party for a Halloween theme party or as a viewing party for one of the fairytale movies or series. This can be an all-ages party if you'd like, but if you're looking for an adult-only party, there's no reason this theme won't work. It wouldn't be a fairytale theme party without princes, princesses and magical creatures walking about. Therefore, encourage your guests to come dressed in costume. Be prepared, however, with tiaras and crowns at the door just in case they forget. Here are reminders of some of our favorite fairytales, in case your guests are looking for ideas. Peter Pan is a classic fairytale with several easy dress-up possibilities. Guests can dress up as Captain Hook in a pirate costume very easily. They can dress up like Wendy or her brothers in a nightgown or pajamas. Snow White offers many possibilities including the princess herself, the wicked queen, or the dwarves. Cinderella is a favorite princess that lends herself to dressing up with companions that include the prince, wicked stepmother and sisters, and fairy godmother. Admit it, don't you secretly wish to wear a princess ball gown and tiara? Rapunzel is another classic tale perfect for a costume—you can't miss this princess if you get her hair right. Jack and the Beanstalk is a great theme for your male guests. The only decision will be whether they want to be the young Jack running with a hen under his arm, or the ferocious giant that chases him. Red riding hood is a good suggestion and I bet you'll find several little reds and wolves turning up at your door, baskets in hand. Beauty and the Beast is another fairytale classic that appeals to girls of all ages. And the guys can choose whether they'd like to dress as the prince or the beast—but my bets are on more beasts at your party than princes. Alice's Adventures in Wonderland is a great, character-filled story that lends itself to many costumes from Alice to the Mad Hatter, to the White Rabbit, the Red Queen, the Cheshire Cat, and so many more. 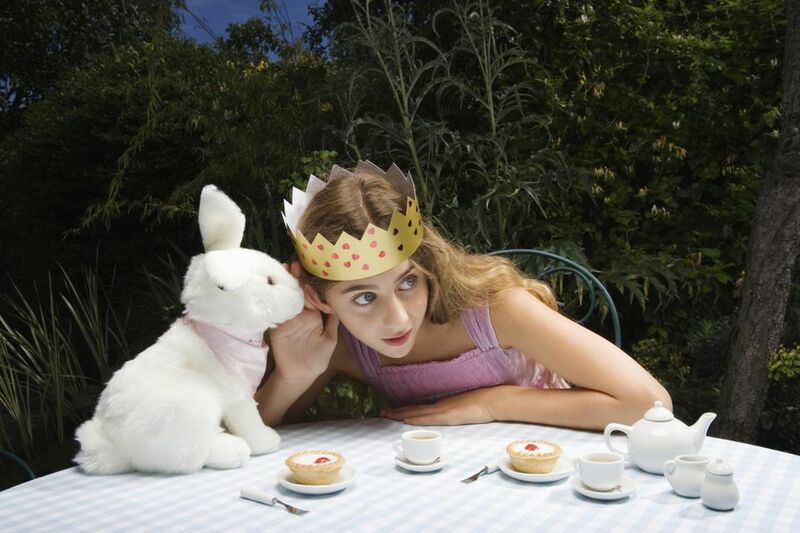 In fact, you could plan a theme party dedicated to Alice's Adventures in Wonderland and not run out of costume ideas! There are so many ways to get creative with this starting off with your entrance to your hallways, to your dinner table! Don't be afraid to go all out. Create a dramatic fairytale centerpiece by filling a large crystal bowl with polished red apples. Place a sign on a tall stick in the center of the bowl that says, "Take One, If You Dare" written in a scary font. You could set a table that plays off the "Alice's Adventures in Wonderland" story with mismatched teacups and plates, and teapots as flower vases. Create a centerpiece using a large top hat filled with a giant toy rabbit, pocket watches, and large exotic flowers as Alice might have encountered in Wonderland. Cover your walls with large sheets of paper that you have sketched to look like the stone walls of a castle. If you're feeling artistic, add a few vines on the stone walls for Jack and the Beanstalk. Don't forget a window for Rapunzel. Please, all of the Belles from Beauty and the Beast at your party with stacks of old books decorating your tables. Add a few candlesticks, teapots and cups as well. Play waltz music in the background to keep the princes and their princesses dancing. Watch out for any lost glass slippers. Bobbing for apples is good if you're continuing with the theme of the poisoned apple, you can ask guests to play this classic game. Play musical chairs around the dining table just as they did in Alice's tea party in Wonderland. Depending on what kind of ages you have at the party, there are plenty of drinks and dishes to choose from! Bloody rum punch: fits the theme of the wicked queens in fairy tales who are always scheming for ways to poison their enemies. The rum in this punch will please the pirates at your bash, too. Cardinal punch: Since there are sometimes happy endings in fairytales, this non-alcoholic punch is fit for the presiding cardinal at the wedding. Boiled edamame will make great themed finger food for your fairytale party. Just fill bowls with the edamame and label them "Jack's Beans". A plate filled with tea sandwiches will reinforce Alice's Adventures in Wonderland theme. Line baskets with pretty dishtowels and fill them with muffins like Red Riding Hood might bring to granny's house. Caribbean chicken and corn casserole: In honor of Jack's stolen hen, serve this tasty chicken and corn casserole. Barbecued pulled pork with potatoes: Don't forget the three little pigs when you plan your fairytale party. Not only is this basic recipe delicious, but there are several tasty variations from which to choose. Old-fashioned apple pie: Please all of the evil witches at your party by serving what's probably one of their favorite desserts and calling it Witch's pie. Vanilla ice cream: Call it Milky White's ice cream for the sake of the theme by naming it after Jack's cow.